Can you believe this is a flower on a tree? I suppose, horse chestnut does look kind of the same, but to me these resemble some sort of Azalea or Rhododendron. They’re absolutely beautiful. It’s a shame the flowers don’t last longer than they do. The blossoms you are looking at are from the Catalpa tree and those blooms are usually gone in about one week. 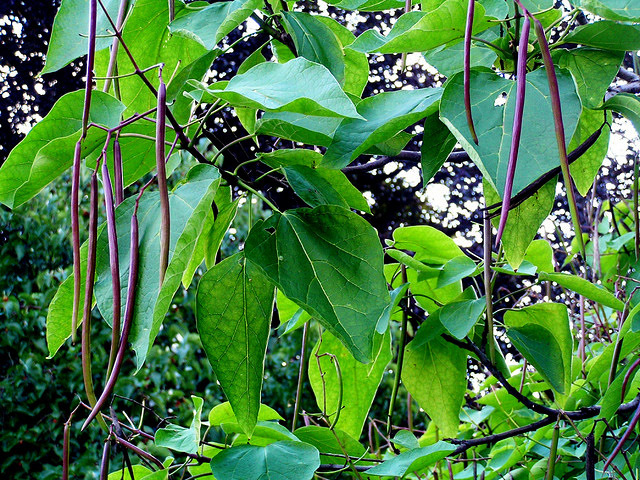 Catalpa speciosa is a genus of flowering plants in the trumpet vine family, Bignoniaceae, that grows in the warm temperate regions of North America, the Caribbean, and East Asia. A tree that’s a member of a vine family… how interesting. Catalpa goes by many other names including northern catalpa, hardy catalpa, western catalpa, cigar tree, and catawba-tree. It is native to Arkansas, Illinois, Indiana, Missouri, Kentucky, Pennsylvania, and Tennessee in the US. Because of its hardiness it is also used north of the border in Canada. Catalpa speciosa is hardy to USDA Zones 4-8. 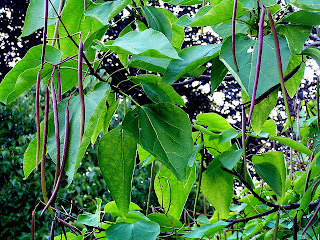 In Halifax (Zone 6) there are a few places where Catalpa has actually been planted as a street tree. Those trees were in flower about two or three weeks ago. They’re quite a stunning thing to stumble across on a walk. I can only imagine what a grove of them would be like. Catalpas are medium-sized deciduous trees, which mean they loose their leaves in the Autumn. The bark is brownish grey with hard, raised ridges. The leaves are quite large and heart shaped, some being in excess of 12” long. The leaves don’t really colour much in the Autumn. If they do it’s only because the frost has hit them and then they turn yellowy brown. The trunk and branches tend to grow crooked. 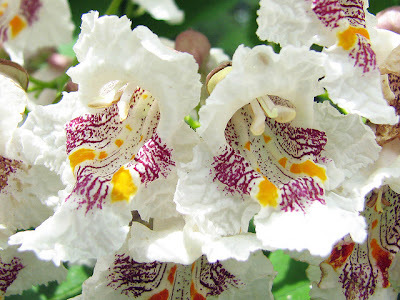 Catalpa is usually grown as an ornamental tree. It prefers moist, high pH soil and full sun, but has been able to grow almost anywhere in North America that it has been planted. The wood is soft like white pine, and quite light in weight. It also is resistant to rot. 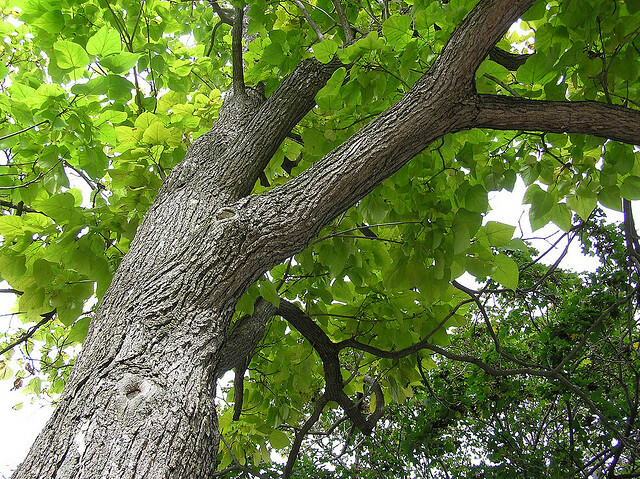 In the 1920s and 30s Catalpa was encouraged as a quick growing source of fence posts in some southern States of the USA. They soon learned in warmer conditions it can be a little invasive. It is more commonly used now in the production of furniture and interior house items, due to its beautiful grain. Northern Catalpa does have some less than serious issues. My feeling is if you can deal seasonally with an apple tree, you can deal with a catalpa. Catalpa doesn’t really like the idea of growing straight. If being grown for lumber, this makes sawing a challenge. The second problem is all those seeds and blossoms. The spent blooms tend to flutter away (like the apple), but the long pods open up while still on the tree and blow seeds to the four winds, making clean-up a bit of a chore. The seed pods then dutifully drop from the tree so you have to clean them up as well. The third is it’s penchant for fast growth which is why they were grown in the South in the 1920s. 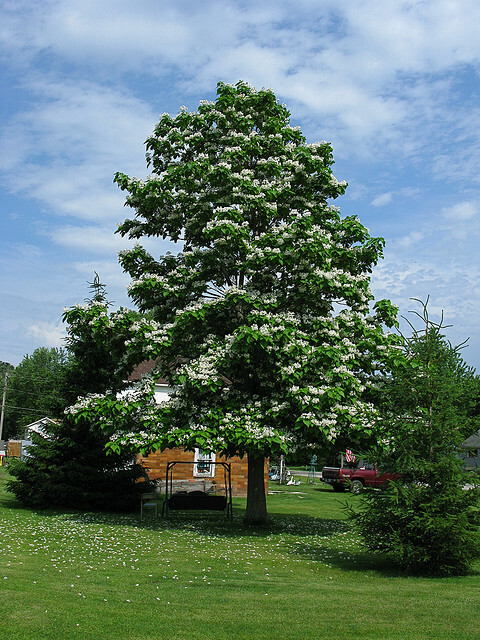 A mature Catalpa can easily crowd out, and shade, other plants in smaller gardens so leave room for its full size. This last problem I haven’t seen in practice here. The street trees in Halifax seem to hover around 20 feet high by about 15 wide. That's a manageable size for a tree with blossoms as beautiful as these. Catalpa are a gorgeous specimen and bloom at a most opportune time. Early August in Nova Scotia is a time when all other blooming trees are well on their way to bearing fruit. 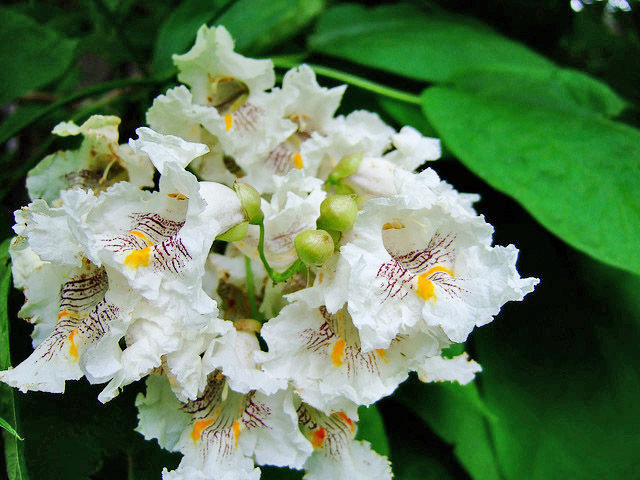 So the Catalpa could be a good specimen plant to ensure mid-Summer garden enjoyment. What a surprise to stumble across another Catalpa lover - and right in my back yard - so to speak. I was also surprised 30+ years ago upon seeing Catalpas in Halifax when I first moved here from Alaska. I had nostalgic memories of this tree from my childhood in Pennsylvania. Fast forward 36 years. Last Spring I planted catalpa seeds I collected from some specimens on Morris Drive in Dartmouth. They dutifully sprouted and I now have a half-dozen or so seedlings in 10cm pots. My own Catalpa farm! I've already staved off an attack of the caterpillars and now this morning's temp is hovering around four degrees - early Sept. and already I am going to have to use the F-word. So now I am wondering - how do I best get my babies through the first winter? I am wondering if you have had trouble growing them from seed based on your comment, quote "This year I’m going to collect seeds – again..."
I would love to hear of your experiences and consider any advice you may have in this regard. P.S. The Cdn Tire on Lacewood Drive in Hfx. had four 12-ft Catalpas in their garden centre this Spring. Only $40 at the end-of-season sale. But they were a mop-headed variety which I do not find attractive at all. To one holding a hammer everything looks like a nail. - Anon. I have had nothing but failure in trying to sprout them. This is from No experience, but I sprouted a golden rain tree and plan on keeping it inside in the basement over the winter. At least it won't die...unless I forget to water it! By year 2 it should be OK for outside, depending on how tall it is. I'll have to look this spring in Clayton Park Can Tire. Thanks! Here's hoping they make it. I may take you up on your most generous offer come spring. I would also like to start some seeds of the Empress Tree (Paulownia tomentosa). They have a mature one at the Annapolis Royal Historic Gardens. It gets covered in purple foxglove-like flowers.